Eco-PT is a large research group spread over many institutes in the UK and China. The UK team includes Paul Wignall, Alan Haywood, Dan Hill, Alex Dunhill, Rob Newton, Bethany Allen and Jacopo dal Corso at the University of Leeds, Mike Benton, Armin Esler and Tom Stubbs at the University of Bristol, Barry Lomax and Matthew Kent at the University of Nottingham, Wes Fraser at Oxford Brookes University, Mark Hounslow at the University of Lancaster and Jason Hilton at the University of Birmingham. The Chinese partners are mostly based at the China University of Geosciences (Wuhan) where the large team is led by Professors Tong Jinnan and Chen Zhong-Qiang, but also includes Liu Jun at the Institute for Vertebrate Paleontology and Paleoanthropology in Beijing. The Eco-PT research team is investigating the cause of the Permo-Triassic mass extinction, especially in terrestrial settings, and the nature of ecosystem rebuilding in the aftermath. This was the worst crisis in the history life and was accompanied by extraordinary climatic change and a period of prolonged and fitful recovery, spanning several millions years, that was unparalleled in the history of mass extinctions. There has been much speculation that the catastrophic extinctions on land at the end of the Permian, were attributable to ozone destruction by halogen emissions related to Siberian volcanism but there has so far been no proxy evidence to show this.We plan to test this idea with a two-pronged approach. The photo-oxidation of SO2 is sensitive to its exposure to UV radiation which varies according to where in the atmosphere this occurs. Volcanic SO2 emissions are likely to have been substantial during the Siberian eruptions and photo-oxidation of this gas is likely to have taken place in the stratosphere wheresulphur mass-independent fractionation occurs. This therefore provides a potential signal of large-scale eruptions (Savarino et al., 2003). Hence, the combined use of multiple isotope systems of S and O in atmospherically-derived sulphate will be used to see if Siberian volcanism was able to perturb the oxidative capacity of the atmosphere. Potential UV-B damage in plants can be detected by the elevated concentrations of UV-B absorbing compounds in resistant organic molecules such as sporopollenin (Lomax et al. 2008). Such a biomarker proxy has been shown to be of utility in younger strata and we aim to see if this phenomenon can be detected in the Permo-Triassic extinction interval and thereby provide the first clear evidence for ozone destruction during the mass extinction. 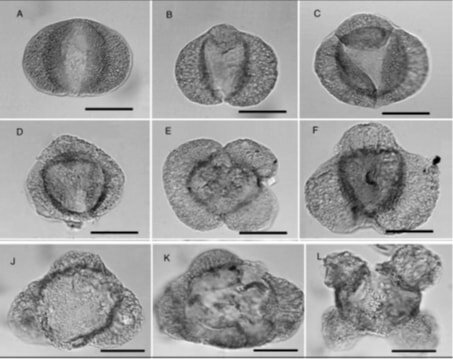 The extinctions are associated with major environmental changes and an extreme greenhouse climate that is thought to have persisted well into the Triassic. Understanding the controls and feedbacks in this scenario are little understood and modelling of the climate, usingthe HadCM3L version of the UK Met Office Unified Model, will help us to investigate this problem. This in turn will be combined with investigations of the recovery interval in the Early Triassic. Questions being addressed are: how stable were the terrestrial ecosystems? This can be tested using trophic network models that producecascading extinctions on graphs that explore stability/resilience of ecosystems during perturbations (e.g. Roopnarine & Angielczyk 2015). The rates and modes of evolution during the recovery will also be investigated using phylogenetic comparative methods to see if factors such as diversity and morphological variability increased in tandem or independently (e.g. Benton et al. 2014). Our ultimate aim with these studies is get a holistic understanding of the climatic and environmental changes during the world’s greatest crisis and its aftermath, and compare these with the response of life and its ability to recover its resilience and diversity. ​Benton, M.J., Forth, J. & Langer, M. 2014. Models for the rise of the dinosaurs. Current Biology 24, R87–95. Lomax, B.H. & Fraser, W.T. 2015. Palaeoproxies: botanical monitors and recorders of atmospheric change. Palaeontology 58, 759–68. Roopnarine, P .D. and Angielczyk, K.D. 2015. 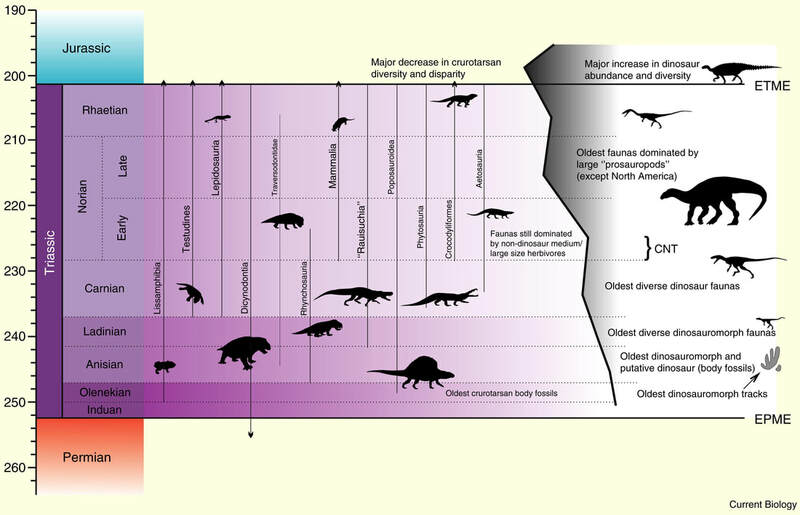 Community stability and selective extinction during the Permian-Triassic mass extinction. Science 350, 90–3. Savarino, J., Romero, A. et al. 2003. UV induced mass-independent sulfur isotope fractionation in stratospheric volcanic sulfate. Geophysical Research Letters 30, doi: 10.1029/2003GL018134.